The 2013 city.people.light award ceremony took place on the 15th of November 2013 in Guangzhou, China, during the LUCI Annual General Meeting. Call for applications for cpl award 2013! Cities are invited to send in their entries for the 11th edition of the cpl award. The deadline for entries has been extended to the 23rd of August 2013. 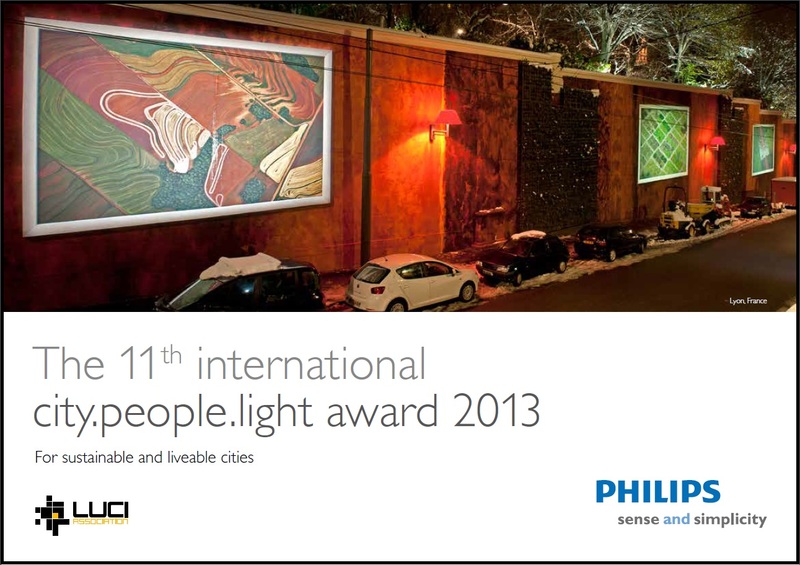 The 2012 city.people.light award ceremony took place on the 16th of November 2012 in Medellin, Colombia, during the LUCI Annual General Meeting. 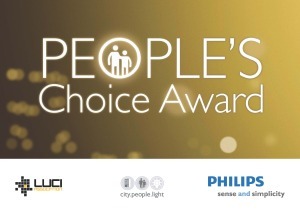 This year, to celebrate the 10th anniversary of the competition, Philips and LUCI will be awarding a special prize – the People’s Choice Award. You can find a short summary of the last 9 winning projects from the year 2003 to 2011 on the People’s Choice Award website. Click here and vote for your favourite entry! 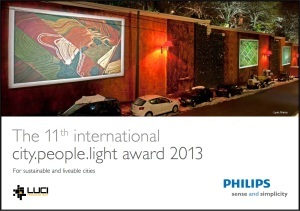 The project with the most votes will win the People’s Choice Award during the city.people.light award ceremony on the 16th of November during the LUCI Annual General Meeting 2012 in Medellin, Colombia. Call for applications for cpl award 2012! Cities are invited to send in their entries for the 10th edition of the cpl award. Deadline for entries is 30th July 2012. The 2011 city.people.light award ceremony took place on the 17th of November 2011 in Gothenburg, Sweden, during the LUCI Annual General Meeting. 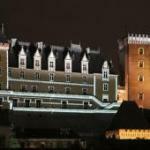 Mr. Javier León de la Riva, Mayor of the City of Valladolid, was presented with the first prize of the city.people.light award in recognition of the city’s ‘Rivers of Light’ project. 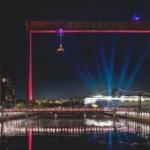 The Dutch city of Rotterdam and Kanazawa in Japan won second and third place respectively, and the City of Le Havre (France) received a special mention. Download the cpl 2011 brochure (english) and entry form (english). The winners of last year’s award were announced at the city.people.light award ceremony during the LUCI Annual General Meeting in Chartres (France) on the 17th of September 2010. In 2009, winners of the first and joint second prizes were respectively: Jyväskylä (Finland), Hangzhou (China) and Lachen (Switzerland). Special mentions: Copenhagen (Denmark) and Moers (Germany). In 2008, winners of the first, second and third prizes were respectively: Seoul (South Korea), Riga (Latvia) and St Gallen (Switzerland). In 2007, winners of the first, second and third prizes were respectively: Heinsberg (Germany), Geneva (Switzerland) and Sao Carlo (Brazil). In 2006, winners of the first, second and third prizes were respectively: Vienna (Austria), Leipzig (Germany) and San Luis Potosi (Mexico). In 2005, winners of the first, second and third prizes were respectively: Cologne (Germany), Tampere (Finland) and Cannes (France). In 2004, Gent (Belgium), Copenhagen (Denmark) and Caltagirone (Sicily). In 2003, Cergy (France), Magdeburg (Germany) and Zeven (Germany).